‘Fruit large, of a pyramidal figure, tapering from the crown to the stalk, about three inches and three quarters long, and two inches and three quarters in diameter. Eye small, in a shallow basin. Stalk an inch long, curved, inserted very obliquely in the fruit without any cavity. Skin yellowish green, when fully matured with a few brownish specks on the sunny side. Flesh white, melting, and full of a very rich, saccharine, high-flavoured juice. Ripe in November, and will keep good till Christmas.’ [George Lindley – Orchard Guide p.351/1831]. But this may be the ‘spurious sort’ described by Andrew Knight in the notes below. A different pear to ‘Uvedale’s St. Germain’, which see, a pear very similar in appearance but which differs in that it is considered to be a culinary pear rather than a dessert pear. ‘Merlet, the French pomologist, wrote in 1680 that this pear originated from a wilding on the banks of the Fare, a little river in the parish of Saint Germain d'Aree.’ [Pears of New York p.535]. 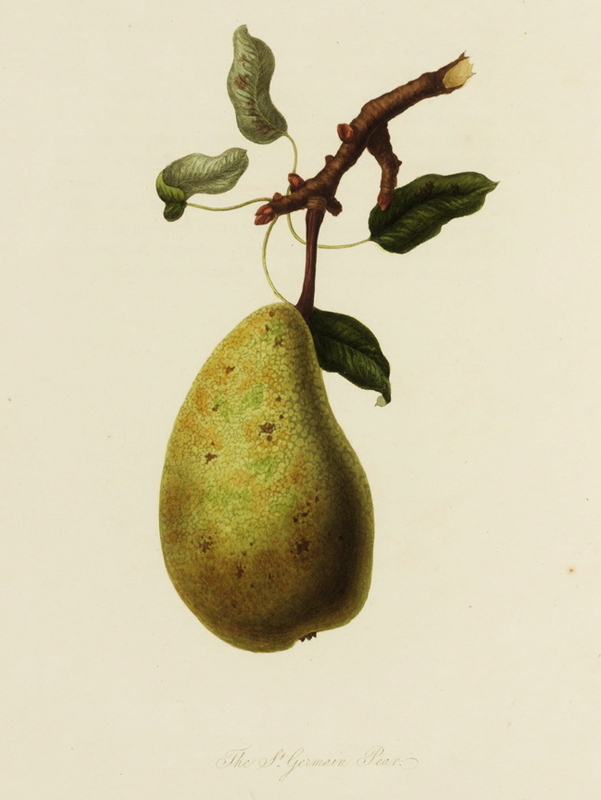 ‘The following account of the true, and spurious varieties of the St. Germain Pear, was sent with some grafts of the variety, to the Horticultural Society by Mr. Andrew Knight; and is copied, by permission, from their Transactions. “Merlet, who wrote in the latter end of the 17th century, has described two varieties of the St. Germain; and Du Hamel has admitted the accuracy of Merlet’s account. These varieties so closely resemble each other, in their wood, their buds, their foliage, and blossoms, that it is impossible to distinguish the one from the other; and there is also much similarity in the external character of their fruit. Both varieties are known in this country; but I have seen one only sent out from the nurseries round London, and that the inferior or spurious kind: I have, therefore, sent a few true St. Germain, under the hope that they may prove acceptable to some Members of the Horticultural Society. The spurious variety ripens in December, and the fruit grown in my garden here, and in other gardens of this neighbourhood, remains green when ripe, and generally decays before the end of January; and, if the soil and season be not favourable, it is watery and insipid. The form of the spurious variety, as Du Hamel has remarked, is less long, and subject to much more variation than that of the true variety. The true St. Germain remains in perfection till the latter end of March, and may be easily preserved until April, and is amongst the very best of the Winter Pears.” – Hort. Trans. Vol. I p.226.’ [PL vol.1, pl.5/1818]. Listed in the 1850 and 1857 catalogues [Pear no.24/1850]. There is no diary entry for this pear.